PPS created a vision for a central market square with the developers of Pedra Branca, Brazil’s groundbreaking ‘new urbanism’ town development in the State of Santa Catarina. Local stakeholders, students, residents, designers and members of the development team were led through a series of training and visioning workshops about the principles of creating and operating successful public places, square and markets. The market square will be the town’s gathering place for an eventual 30,000 residents. 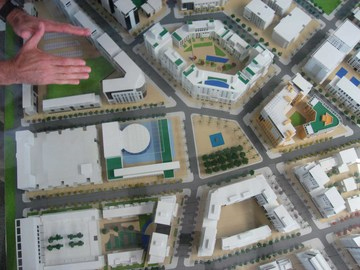 The market square is planned to be both a square and a market anchoring the adjacent commercial, residential and academic sectors. Temporary outdoor markets and festivals will be accommodated on the square and plans were also formulated for indoor market activities on properties facing the square. The market will promote local agriculture, aquaculture and horticulture while acting as the social hub for residents and visitors. The Pedra Branca development is one among 16 founding projects of the Climate Positive Development Program, a Clinton Climate Initiative (CCI) program that will support the development of large-scale urban projects that demonstrate cities can grow in ways that are "climate positive." Climate Positive real estate developments will strive to reduce the amount of on-site CO2 emissions to below zero.